How do you walk with your children during times of struggle and crisis? Do you feel as if nothing you do will be enough? Where do you find peace? Judy Landrieu Klein struggled with her faith as she lived through her son's near-fatal addiction to drugs and her daughter's painful anxiety. She discovered she couldn't handle the relentless pressure of life not measuring up to her expectations and it was eating away at her family. Klein considered Mary's reaction to the events in the life of Jesus. She meditated on Mary's fiat and her prayer of total surrender to God's will and saw how this act of obedience carried on throughout Mary's life as she witnessed the life of her son. As Klein focused on her devotion to the Blessed Mother, her life and faith were transformed. In Mary's Way, Klein reflects on the Annunciation and describes her own to struggle to embrace the will of God by surrendering control of her family planning. She meditates on Mary's powerlessness during the Crucifixion, finding a place of calming surrender during her own son's escalating battle with addiction. 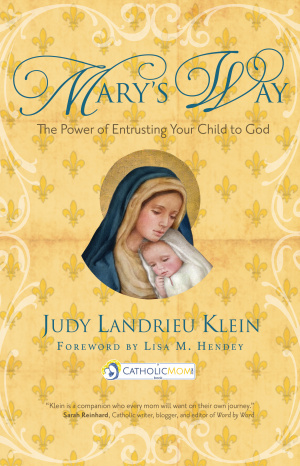 Mary's Way by Judy Landrieu Klein was published by Ave Maria Press in September 2016 and is our 68952nd best seller. The ISBN for Mary's Way is 9781594716690. Be the first to review Mary's Way! Got a question? No problem! Just click here to ask us about Mary's Way.